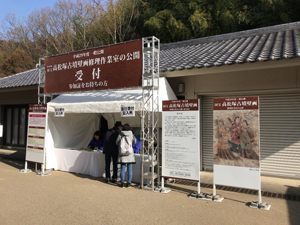 I participated as a staff explained in the public exhibition of the conservation facility for the mural paintings of Takamatsuzuka Tumulus, which are designated as a national treasure. 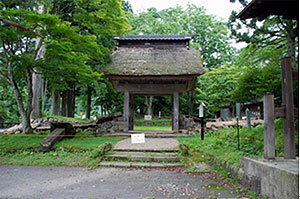 After the dismantling of the stone chamber from Takamatsuzuka Tumulus in 2007, the conservation facility was opened to the public twice a year. From 2017 onward, the frequency of public exhibitions of the facility, along with the mural paintings of Kitora Tumulus at Shijin no Yakata, the Kitora Tumulus Mural Experiential Museum, was increased to four times a year. Tokyo National Research Institute for Cultural Properties has been hosting these events since the first time the facility was opened to the public. At the 20th public exhibition held recently, we placed the West Wall (Group of Female Figures, White Tiger, and Group of Male Figures) and the North Wall (Black Tortoise) in the area close to the exhibition corridor to provide visitors a view of the progress of the conservation of the mural paintings since they were taken out from the tumulus ten years ago; moreover, visitors can compare the paintings with the mural painting of Black Tortoise from Kitora Tumulus, which was also on exhibition at the same time. 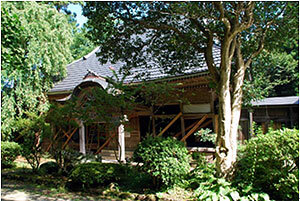 Although the event was held during winter, when the number of tourists to Asuka Village is low, it attracted approximately 1,000 visitors, including people without pre-registration. Many visitors were amazed with the progress of the cleaning of the mural paintings, and left with newly developed interests in the future restoration process and exhibitions. Since 2000, the National Research Institute for Cultural Properties, Tokyo has been promoting a joint research study with Usuki City to establish the conservation plan of the Usuki Stone Buddha Statues, a national treasure and a designated historic site for the next term. On November 6th, we held report presentations on the results of research for these 10 years in the Debriefing Session on the Conservation Environment of Usuki Stone Buddha Statues at the central community hall of Usuki City. Mr. Takeo Oku at the Agency for Cultural Affairs first made a speech on the significance of the conservation plan for the next term, followed by Mr. Shoichi Shimoyama at Kyushu University presenting a lecture on the Aso ignimbrite, on which the Usuki Stone Buddha Statues were sculpted. Then Mr. Lee Chan-hee at the Kongju National University and Mr. Kim Sa-dug at the National Research Institute for Cultural Properties in South Korea gave lectures about the survey on the deterioration states of stone cultural properties in South Korea and the conservation of them. Following these lectures, the researcher of our Institute made a report on the results of research, including the outline of research, the deterioration state of the surface of rock-carved Buddha statues, and the water and air environments. By reviewing the results of the survey on the causes of deterioration, the researcher also made some proposals about measures against deterioration, such as antifreeze measures during cold periods and measures for inquiline control, as well as deterioration monitoring techniques. Closing the session, the Usuki City Education Board presented draft plans about a conservation project for the next term and subsequent monitoring and maintenance, with a title called the Vision of Long-Span Conservation Plan for Usuki Stone Buddha Statues. They asked the participants for their understanding. Although our research continued for an unprecedented 10 years for one cultural property, we have gained a lot of results here. We hope that these results will be utilized to conserve not only the Usuki Stone Buddha Statues, but many other stone cultural properties as well. The Center for Conservation Science and Restoration Techniques is conducting joint research on environmental impact Institute (USA) spoke on energy conservation for museums with consideration for storage and display environment and Mr. Shiraishi Yasuyuki of the University of Kitakyushu spoke on comprehensive assessment system building environmental efficiency (CASBEE) and its case studies. Reports on concrete endeavors on this matter were also given by the Kyushu National Museum and Saitama Prefectural Museum of History and Folklore. A total of 141 people participated in the seminar and held active discussions. 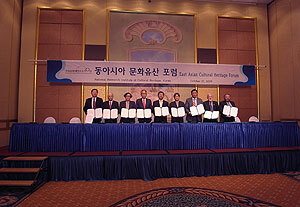 on cultural properties and development of restoration techniques together with the Conservation Science Division of the National Research Institute of Cultural Heritage, Korea. Currently, research is being conducted to find the causes of deterioration of stone heritage in an outdoor environment, including Buddhist images carved on natural cliff, and restoration materials and techniques are being developed and evaluated. In addition, a seminar is held once a year alternately in Japan and Korea. 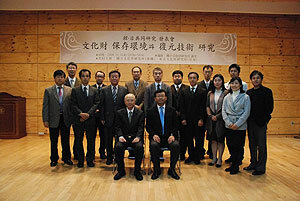 This year’s seminar was held on November 6, 2008 in the lecture hall of the National Research Institute of Cultural Heritage, Korea. Director Suzuki Norio and 5 researchers from the National Research Institute for Cultural Properties, Tokyo, attended. Kuchitsu Nobuaki and Morii Masayuki of the Institute and Yamaji Yasuhiro of Beppu University presented case studies of the conservation of stone heritage in Japan. 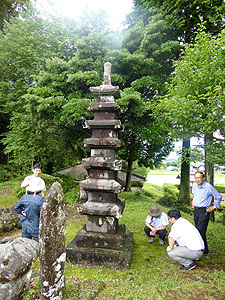 Before the seminar, visits were made to conservation sites in Kyongju – stone pagoda of Bulguksa temple and the three-storied pagoda of Gameunsa temple site – and discussions were held with Korean researchers on restoration materials and techniques. A visit was also made to the Museum of Kyungpook National University in Taegu to investigate the objects excavated from Dae-gaya. We hope to continue such joint research and to increase interaction between Japan and Korea. 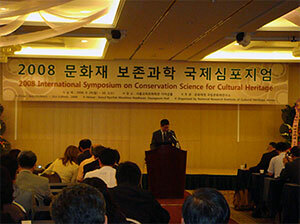 Three members of the Center for Conservation Science and Restoration Techniques -ISHIZUKA Takeshi, HAYAKAWA Yasuhiro and MORII Masayuki – participated in the “2008 International Symposium on Conservation Science for Cultural Heritage” that was held at the Seoul Educational Cultural Hall from September 29, 2008 to October 1. 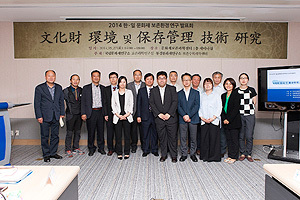 The National Research Institute of Cultural Heritage, Korea, which hosted this symposium, has received a large research and development budget allocation in the conservation science area from the government of South Korea since 2006. The symposium was held partly to announce this achievement. Presenters for this symposium included 24 people from 7 other countries and 29 people from Korea, and active discussions took place in many fields. 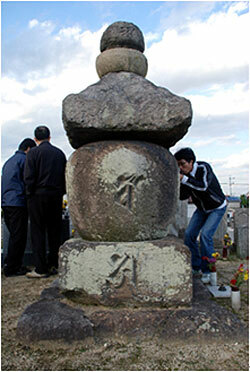 The National Research Institute of Cultural Properties, Tokyo is engaged in research project for the conservation of the Kitora Tumulus, a Special Historic Site. This is a project that has been entrusted to the Institute from the Agency for Cultural Affairs. In this project, the interior of the stone chamber is inspected regularly and its wall paintings on the plaster are being detached. Particularly, the painting of the astronomical chart on the ceiling has been detached sequentially ever since a part of the painting had fallen and was found on the floor in July 2007. Initially, only small areas of the painting where the risk of exfoliation was very high were detached. However, with improvement in the tools used to detach paintings, it is now possible to detach a square piece of the wall painting about 10 cm on a side. As a result, the northern half of the astronomical chart has been detached as of the end of June 2008. The paintings　will continue to be detached on a regular basis. As for the painting of the astronomical chart on the ceiling, our goal is to detach the entire painting within this fiscal year. 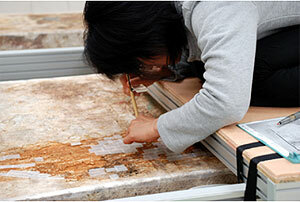 The National Research Institute for Cultural Properties, Tokyo conducts joint research with the National Research Institute of Cultural Heritage of the Republic of Korea to study the influence of environmental pollution on stone cultural properties and to develop restoration techniques. 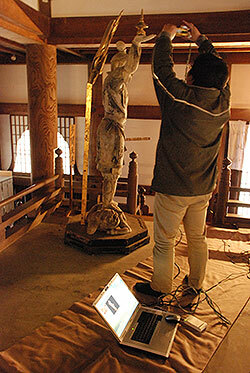 From November 20 to 24, Morii Masayuki and Chang Dae Suk (Tohoku University of Art and Design) investigated the present condition of the conservation of stone cultural properties, focusing on stone pagodas and stone Buddhas in southeastern Korea (Kyongju and Taegu). 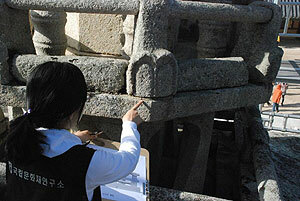 In Kyongju, investigations were made of stone pagodas including the Three-storied Pagoda of Gameunsa Site (a national treasure). This pagoda is made of tuff, which is unusual in Korea. 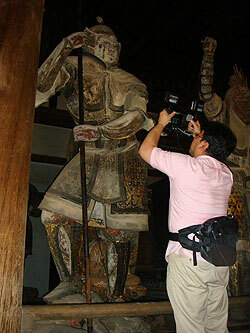 It has been damaged much due to weathering and is being restored by dismantling by the National Research Institute of Cultural Heritage, Korea. During this visit, we visited the restoration site and held discussions on restoration materials and techniques with Korean researchers. On the following day we moved to Taegu to visit the 2nd Seog-gul-am (a national treasure) where granite Buddhist statues are placed in a niche carved into a natural cliff. It has been decided that investigations will be made to clarify the mechanism of deterioration, including water leakage inside the niche and flaking of the surface of Buddhist sculptures, and that discussions will be held on conservation plans in the future. On November 23, we participated in the International Symposium on Conservation of Stone Cultural Properties held at the Kongju National University and spoke on the investigation that the National Research Institute for Cultural Properties, Tokyo is conducting at Usuki Stone Buddha, a national treasure and an important historic site. We received questions and much advice from many researchers that will be of use in the future. 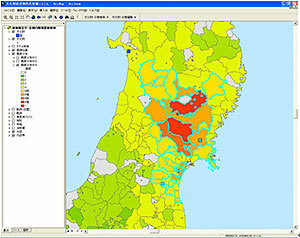 An earthquake of magnitude 6.8, maximum JMA seismic intensity 6+ hit the Chuetsu district of Niigata prefecture at 10:13am, July 16, 2007. In addition to large scale damage including total or partial destruction of houses and the severing of infrastructure that occurred in Kashiwazaki city and its vicinity near the epicenter, many cultural properties were also damaged. The Center for Conservation Science and Restoration Techniques held an on-site investigation concerning the damage caused by the earthquake to cultural properties in order to obtain information about the condition of and factors for damage and to provide advice on emergency measures and future restoration plans. 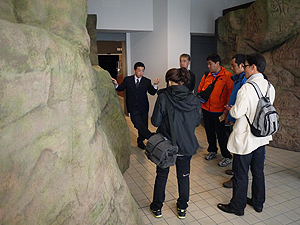 Investigation was conducted on September 4 and 5 at museums and built heritage in Nagaoka and Kashiwazaki cities. 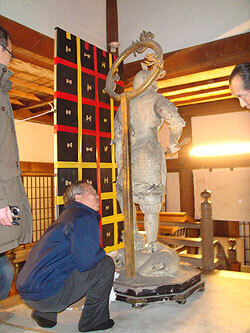 A museum in Nagaoka was first investigated. Fortunately, much damage was not observed on the exhibited and stored objects including flame-style earthenware. An interview with a curator revealed that a reconsideration of methods of exhibition and storage based on the experience of the earthquake in 2004 had produced good results even though large quake was experienced in the city. On the following day, investigation was conducted in Kashiwazaki, closest to the epicenter. The condition of overall damage was quite tragic, beyond comparison from that in Nagaoka, and the same was true of cultural properties, For example, the main hall of a temple had been totally destroyed. 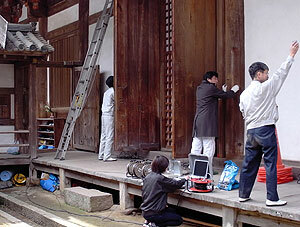 Large earthquakes have occurred frequently in 2007, beginning with the 2007 Noto Peninsula Earthquake. The National Research Institute for Cultural Properties, Tokyo will continue to conduct research on protecting cultural properties from disasters and to make efforts, through actively publicizing information, so that many more people would be aware of disaster prevention. 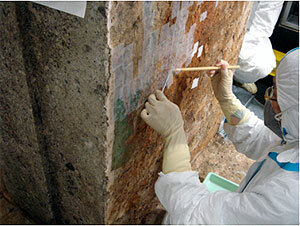 The National Research Institute for Cultural Properties, Tokyo is engaged in the conservation project for the wall paintings of the Kitora Tumulus, a Special Historic Site. This is a project that has been entrusted to the Institute from the Agency for Cultural Affairs. In this project, the inside of the stone chamber is inspected regularly to protect the wall paintings from microorganisms and the wall paintings on the plaster are being detached from the stone walls. At the Kitora Tumulus, paintings of the four guardian gods of directions and the twelve horary signs on the side walls have already been detached; only the ceiling and the painting of the constellations remain at the site. 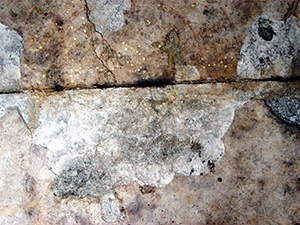 In July a part of the painting of the constellations had fallen and was found on the floor. Investigations that followed revealed that there are several tens of places where the risk of exfoliation is high. Thus, the painting is in a very serious condition. So the Institute has started to detach the paintings from places where there is great danger of its becoming falling. With the dismantling and transporting of the first stone of the west wall on which is drawn a painting known as “Group of Male Figures” to the Temporary Restoration Facility on June 26, the dismantling of the stone chamber of Takamatsuzuka Tumulus that started in April 2007 has been completed with the exception of the floor stone. 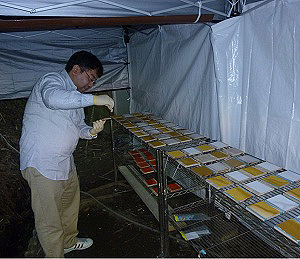 The National Research Institute for Cultural Properties, Tokyo is engaged in the work of conserving the wall paintings of Takamatsuzuka Tumulus, including the restoration of the paintings, biological investigation and environmental control. 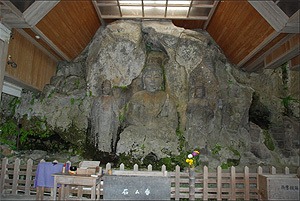 The following sections of the stone chamber were dismantled and transported (in order): June 7th – the second stone of the east wall (Seiryu, the blue dragon); 14th – the second stone of the west wall (Byakko, the white tiger); 15th – south wall; 22nd – the first stone of the east wall (Group of Male Figures); and 26th – the first stone of the west wall (Group of Male Figures). The restoration team removed the plaster that covered the spaces between the stones and applied synthetic paper to the surface of the paintings in order to transport them safely. 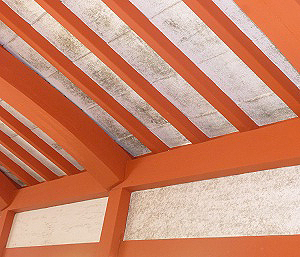 Materials needed as well as the timing for doing this work was carefully considered so as to reduce the risk of fungal growth. 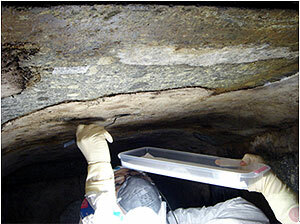 Moreover, every time a stone was taken out, the biology team investigated the microorganisms within the tumulus. As the stone chamber was dismantled piece by piece the environment team covered what was still left of the chamber with insulation in order to keep the humidity around the paintings stable. 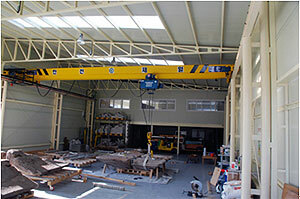 Stones taken into the Temporary Restoration Facility will undergo photographing, sampling and cleaning. They will then be taken into the restoration workroom. After the facing on the surface is removed, the condition of the wall paintings will be observed and recorded in order to collect information necessary for the restoration of the wall paintings which will be conducted over a long period of time.